I want to encourage the interest in this template https://www.warlight.net/MultiPlayer?GameID=9080229 because its fun and at the moment i find it hard to get enough people together to play a game on it. It's quite hard to play if youre not familiar with it so I have written some theory. The most important thing that people miss is the strategic importance of the 3 big areas (centre, russia and islands) Im going to call them continents because i need a word and i cant think of a better one. There is an image at the bottom of this post showing the 3 areas (continents). The rest of the map is far less important. pick 20-24 picks or youll likely end up with randoms. pick the smaller bonuses with good income to size ratio first eg iceland, ireland, denmark, slovakia, switserland, austria, west central russia. >generally speaking, islands is the best area, then centre then russia then everything else. >all else being equal iceland and ireland are the best territories on the map, followed by denmark because theyre all small, high income and easy to defend. 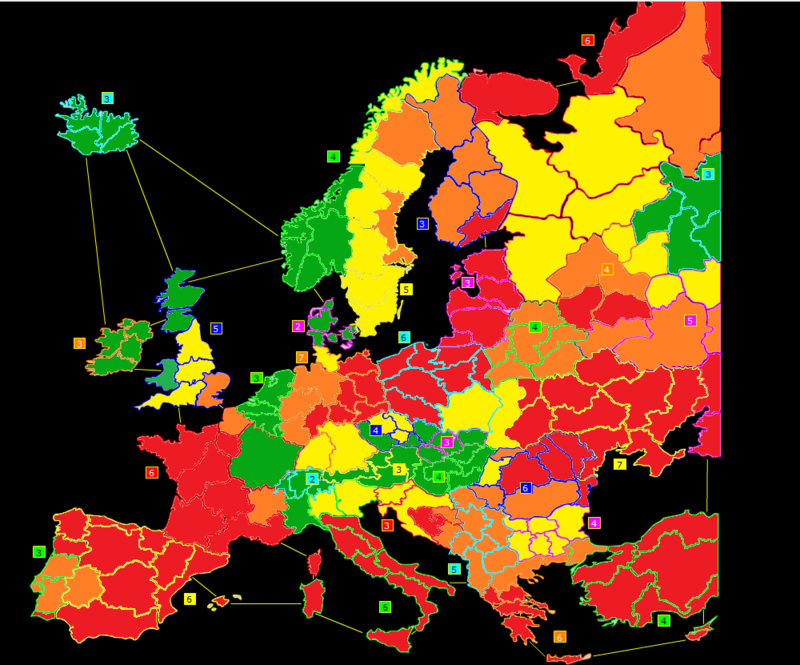 >ftbs that are very exposed (the centre) are sometimes not as good as safer slower picks eg denmark, iceland, ireland. >look out for ftbs you can split between 2 players of the same team. One player can make an attack of 1 against a neutral territory and allow the other player a 3v2 3v2 2v1 to complete a 4 territory ftb, off 1 pick. >Generally your team should agree on picks and then mirrror unless there is a good reason not to. I tend to give each player a FTB first if there are a few of roughly equal value so that my team doesnt step on each others toes, and then go on to mirror picking. Also if i feel that portugal spain needs to be picked, bulgaria romania needs to be picked and sweden finland needs to be picked i will give each team member a different double pick to promote synergy. I will then also adjust their other picks so that the person who get finland sweden doesnt also get west central russia. >dont aim for triple picks like a 2 turn belarus, SW russia, poland or bulgaria especially with your 1st 2nd 3rd picks. its been tried before it doesnt work, i promise. even if you get your dream picks then the rest of your team is left to 2v3 for long enough that theyre fucked. >dont attack neutrals if you can help it, staying still is usually a decent option. >you dont need everyone on your team to have a bonus, a player with no bonus but a decent sized stack can cause a lot of chaos especially if they romp around the centre. >dont aim for safe picks. portugal is the main offender here, also bulgaria and turkey, baltic states. they should be made once youve picked the centre and russia and islands. safety is an illusion, europe is a bloodbowl, get into the ring and fight. Seriously though, if you get enough picks close together, they will all make each other a little bit safer, without having to cede the best real estate. >if your team own one of the continents and the other two are contested you will likely win. if you own 2 and the other is own by the other team you will almost always win. so aim to dominate one of them while keeping the other 2 in contention. this is a better determinant of who will win than income. >try to get each player in your team to have 1 spot in atleast 2 of the continents so that you can use income gained in one to put pressure in another. >Try to exclude one enemy player from the fight by giving them no contact with any of your team, so they are forced to expand (and kill neutrals) while you 3v2 the rest of their team. >try to time your contact so that you can get a 2v1 or 3v1. even for just one turn this is very powerful. If you can organise a way to go from 2v1 against one player to 2v1 a different enemy the next turn you can win even with a fairly big income disavantage. >Its beneficially for a players picks to be far apart geographically, unless they are intending to get a ftb because it gives them a much wider area they can influence. >Russia Vs centre, lutsk is the key to defending the centre. russia has more income but is much harder to defend long term, so usually russia beefs up with NW russia and SW russia then goes all in. If it can take lutsk with brute force it wins, if not then the centre goes through ukraine and russia goes through poland in a race to break the others bonuses. Fun. >Islands vs russia. islands is very easy to defend northern norway is gatekeeper to the islands and also prevents NW russia. Russia usually loses because islands can sacrifice northern norway at any time to bullrush lenningrad. >centre vs islands. If islands takes northern france or has support picks in the bottom right to attack from then they usually win. In a straight fight theyre both equally easy to defend and the centre has access to a lot more income so centre usually wins. continents: islands is the top left of the map: iceland irealand Uk norway denmark and perhaps sweden. centre is benelux, swiss, austria, czech, slovakia, hungary and perhaps W bulgaria. russia is top right, all the ones with russia in the name plus finland and perhaps belarus and baltic states if they have been picked in this game.
""" safety is an illusion, europe is a bloodbowl, get into the ring and fight. """ Bump because i edited in more content. I made this a few weeks ago, I find it very useful to determine which areas are good and which aren't; it will be helpful to anyone who's just started playing Europe and can't be arsed analyzing the map. Would you recommend reading sze's guide for more in-depth detail, or playing to get experience? If you want to play a 3v3 with Me and 2 alts, let me know. I'd recommend removing portugal, poland and east balkans perhaps also bulgaria. Or atleast putting them in a different colour. actually ill do it, once i learn how. perhaps this is too ugly and complicated to be useful to anyone? let me know if this map made anything clearer for you. i find this map very interesting, it underlines the overall value of every single territory rather than the value of the whole bonuses. east france should be green on your map piggy. More editing, please critique. Is all the stuff in "advanced" easily compehensible to people who didnt already know it? It feels to me like im preaching to the choir. If anyone has example games where any of the things are mentioned happen pls send me links. i think 1 should be green,2 should be yellow,3 should be yellow and ? 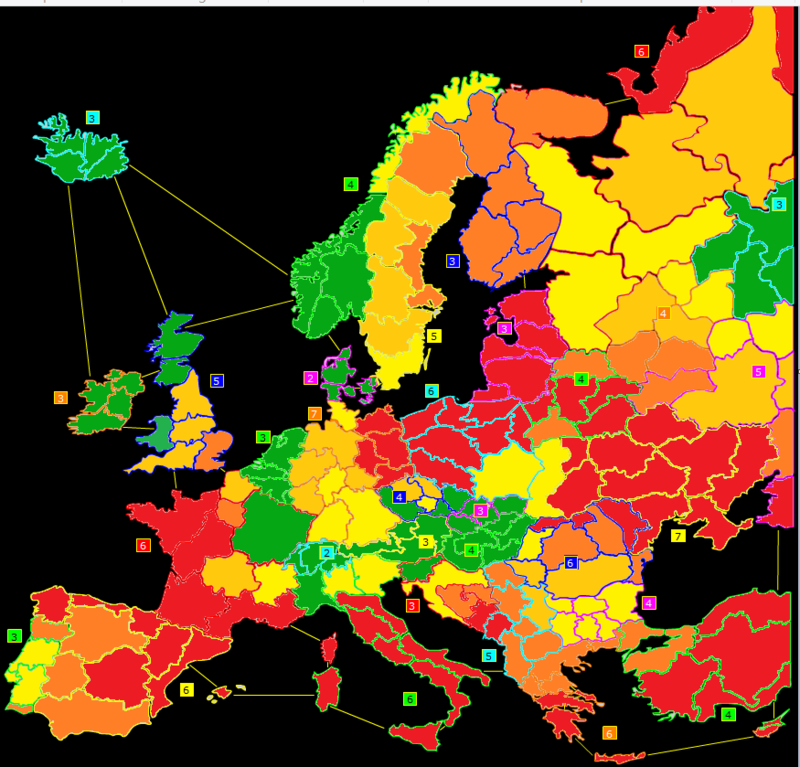 is because i think west balkans as a whole should go from yellow to green,orange to yellow,and red to orange,also i could not get the entire map in one page,can you send me the link to the image? picks are distributed this way: if one team is abc and the other team is DEF then it goes aDEbcFFcbDEa and repeats. In no luck-cyclical this order is defined by a being the first person to commit their orders. This means that the player F will get picks close together. If youre mirroring it can be worth scattering picks rather than picking adjacent bonuses in a row to avoid players F,c and b from getting their first and second picks very close together therby lessening their area of influence. ryiro Ive noticed that you love a good lenningrad or vologda, as a counter to the entirety of russia. I worry that with just 1 pick in russia you put the person with that one pick under a lot of pressure not to get eliminated there. Im not saying its wrong, ive seen it work for you, but that isnt how i pick and i wouldnt endorse it (yet). Russia doesnt play like the other 2 continents because its so open and has such large inefficient bonuses you cant rely on it for income until your team own it completely, and you seem to be exploiting (or emphasising) that. Why do you think 2 should be yellow but rhineland-pfalz should not? I somewhat agree, same with 3. I think I need more colours. theyre okay picks but theyre only supporting one bonus which is already quite meh. I was already toying with west balkans in paint trying to work out what i liked and why. I was waiting to play some more games so i can compare this map to what i actually picks and improve it. Its not a bonus i rate very highly, when i look back over my own picks it rarely gets in the top 15 let alone top 10. Maybe thats wrong of me but the map is there to reflect what i feel about each territory. If you make a new color, make it neon green. You said that was hard to find players. If you play MD, I would join one of your games with pleasure Piggy. added new colours and messed with it a bit. still not happy with it. shouldn't this thread be in general btw? this has nothing to do with ladders until fizzer finally adds the highly requested europe 3vs3. If this were in the General forums it would have been buried beneath all the off-topic crap. Its best that it stays here. Pig you got Skype so i can coordininate games? Or you prefer to play multi day? Btw, love your guide a lot. I assume the host is still inviting players?